Helaine and I took a drive this afternoon. Bad traffic while transitioning from the 91 to the 5 (as we Californians say). I slowed down and stared at the GPS. 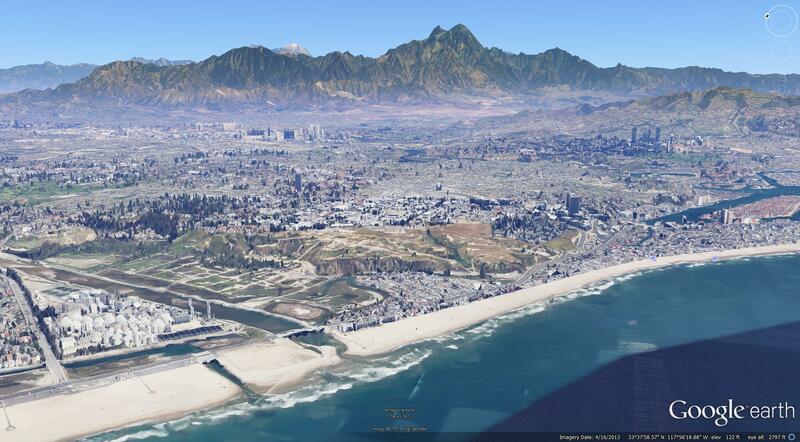 Now that I’ve had Google show it to me from the air I understand. This state was built for cars. Helaine is driving to Santa Monica this weekend. That posed a problem. The power outlet in her car, what in less enlightened times was the cigarette lighter, stopped working. Using her iPhone for navigation would be fine but somewhere along the way she’d run out of juice! Time to fix the outlet. It wasn’t too hard. An old plug must have shed parts in the outlet, shorting it. A pair of needle nose pliers to pluck the old pieces and a spare fuse fixed it. While doing my stint as tech support I cleared out the car’s center console and came across a Garmin Nuvi 260W standalone GPS receiver. It’s at least five years old, maybe older. There are two roads within a mile or two of here which might appear on the GPS. Everything else is newer. It’s possible to buy new maps, I suppose. But why? What this box did is now done faster, cheaper and better by Helaine’s phone. I guess I should throw it out, but it kills me. Five years, that’s it. Jacob Wycoff is in town. I’m not sure if I’m allowed to say what he’s doing, but it’s a cool assignment. We got together for dinner tonight. First time in five years. Jacob is staying in Rosemead. He might as well have told me Mars. I’m clueless. The new car has GPS, so I programmed in the address and set out. Locals always know better shortcuts, but for a territory virgin, GPS is an amazing tool. This nav is hooked into satellite radio. It gets live traffic updates. It was very chatty tonight. First it enumerated all the slowdowns on the 5. Then it told me it was changing the route. My rule with GPS is you believe or don’t. You don’t change your mind mid-route. For safety’s sake, the ability to preview the route isn’t available while you’re in motion. So, when the GPS changes the route, you must accept it on blind faith. Down Irvine Blvd instead of the 5. Through Irvine and Tustin, I rejoined the Interstate in Santa Ana. The GPS wasn’t done yet. It changed its mind once more, taking me back off the 5 and onto city streets… miles and miles and miles of city streets. During the early evening hours freeways here are everything you’ve been led to believe. I-5 has four through lanes plus an HOV lane in each direction. Traffic’s still stop-and-go. This major change seemed plausible. It’s certainly a route no human would formulate. Too awkward. Too disjointed. Too anti-intuitive. Did the GPS save me time? Clueless again. Maybe all the GPS units are sitting around tonight having a laugh on me? It was 1:40 to get there. The ride back, down the 5, thirty five minutes. We’re coming up on six months in SoCal. This six months has gone much faster than the six that preceded it. Living with one foot out the door, unable to make long term commitments, knowing we were going, was difficult. People say moving is stressful. It is. No one does this for fun. There are advantages living in one place an extended length of time. Reestablishing a routine is tough. I had to go to Santa Ana this afternoon. About 20 minutes away. It was someplace new, but landmarks looked familiar. Some, like the Orange County Register’s building, I’d only seen from the freeway. I hardly needed the GPS on the way back. So many things to learn. Where are the light switches in the dark? Who’s got good pizza (not easy here)? We must find a dentist. We have no wired telephone. Contemporaries ask about that, wondering if it’s a switch they should make. Probably. Does AT&T have a cell plan where I could add a second number to my HTC One? That would be great. I don’t want to give up my 203 number. We are trying to get a feel for this new place. We are trying to find our way–constantly. GPS is an immense help, but I want to learn the area. It won’t happen overnight. The image at the top is from Google World. It’s an approximation of what you’d see looking toward Irvine from a perch just offshore. The mountains have been exaggerated to allow more of the land contour to be seen. Most of Southern Orange County is a coastal plain. It’s flat, but it slopes upward toward the mountains. By the time you get to our house, you’re over 400 feet in elevation. The slope is so gentle I never noticed it until I looked at topo maps. We’re 11 miles from the ocean. 400 feet is not a big deal. But if you rolled a marble down the 133, it might make it to Laguna. This time of year there’s virtually no natural above ground running water in SoCal. The dry season began last spring. In Irvine get our water from very deep wells and via aqueduct from Central California, hundreds of miles away. Rain here isn’t as critical as snow in the Sierras. With little moisture, dust becomes a problem. We’re surrounded by construction and farming. There’s no way to stop it. Cleaning always means dusting. Never ending. Land here is very valuable for homes. That’s odd considering how much of it there is. A large portion of the west is protected from development. That reduces what’s available. Until those homes are built, the land is planted. Orange County’s big cash crop is strawberries. There are fields of ripening strawberries we pass nearly every day. It’s still strawberry season. I have seen the observations from back in Connecticut today. The angst I suffered on days like this is not forgotten. I’m very confused. Computers looking over my shoulder have made life easier and scarier. This isn’t a new subject from me, but it hit home last week as we prepared to leave for the weekend. I opened Google Now and saw my flight times listed. I didn’t tell Google I was flying. It figured that out from reading my email. It figures a lot out from what I do. There are currently offers to track packages heading my way and links to articles about Comet Ison. It knows about the packages from my email and the comet from my browsing history. My weather is there too. 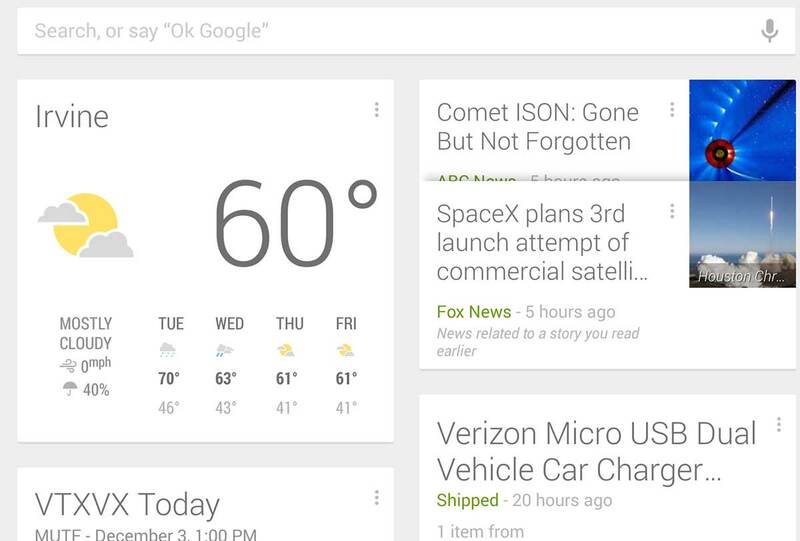 While in Milwaukee, Google Now posted the local forecast plus a link to the weather at home. It knows where home is. 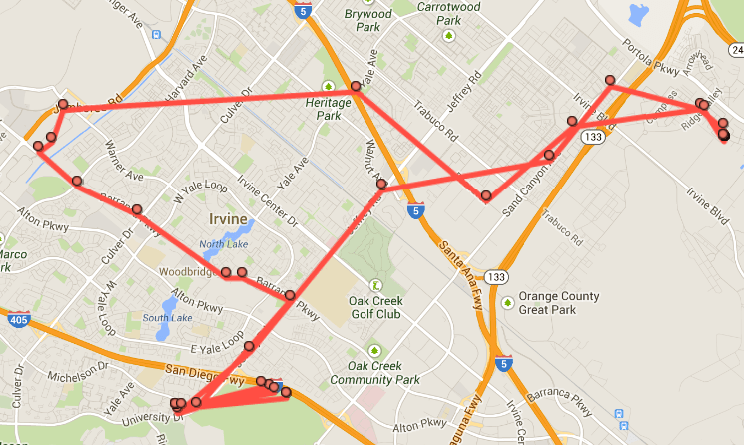 Because I often use my cellphone’s GPS there are maps tracking my every move! Actually, I’m tracked when I’m not using the GPS too. The readings just aren’t taken as often. I assume Google can figure out who my doctor is and where we shop for groceries. It knew I was at Fenway Park June 24th. It can tell when I’ve spent the day at home. Remember, it’s not just my location they know. Google also knows what’s at those locations. I can turn most of this off. I don’t. There are two main reasons. First, if I turn it off I’m the only one deprived of the info. Google and their pals will still know. Second, it’s valuable to me. Having my flight information, or weather in a strange city, or sports scores from just the teams I follow are more valuable when easily found. Having Google Now is like having my own personal assistant. Does it know any less than a flesh and blood personal assistant would? The downside is this information will be used in ways we can hardly imagine. And it will be used without your knowledge even when it’s wrong! While we were in Milwaukee my GPS readout briefly shows me at my parents old condo in Florida. Who do I see to correct that glitch? When the government pushes back against fears of surveillance it’s often stated the information is anonymized. Red herring. My actual name is the least important part of this equation. I’m truly conflicted about all this. So much power to do good. So much potential to be evil. Roger Easton is 92 and lives in Vermont. He has become my hero. Roger invented GPS! His invention came in 1955. That was two years before Sputnik, the first satellite launched to orbit. Here we are in California. We are strangers in a strange land where all the roads cross at a 90&#176. It will take a while. 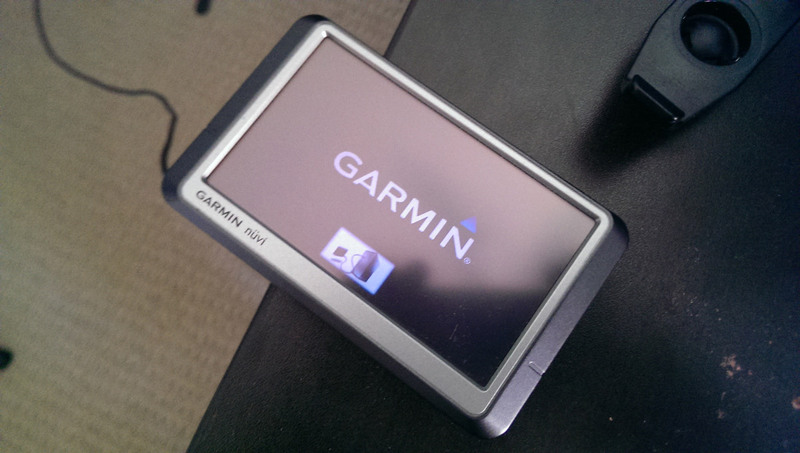 We started years ago with a standalone GPS. Feed it an address and get directions. That in and of itself is nothing short of magic. 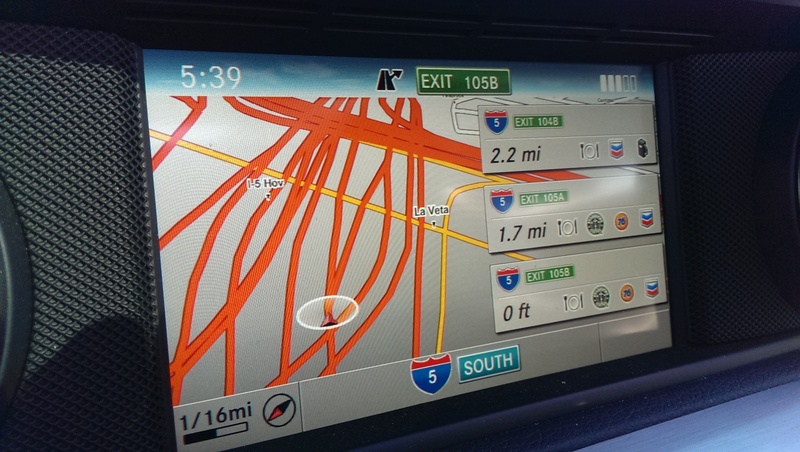 What makes GPS more powerful is smartphone integration. I know. It’s the same technology I despise when used by the government to stalk us. Nothing is simple. Because my phone has a GPS receiver and is connected to the Internet, I can say (not type), “Target” and my phone will find the closest one and direct me there. Even better, you don’t need to know the store’s name! Say, “Bedding” and the GPS will find bedding places nearby. Try picturing yourself doing this with paper maps. They’re OK, but you have to know where you’re going before you use them. You have no idea how valuable it’s been while stocking the new house. It’s cut travel time significantly. It also adds a sense of security. 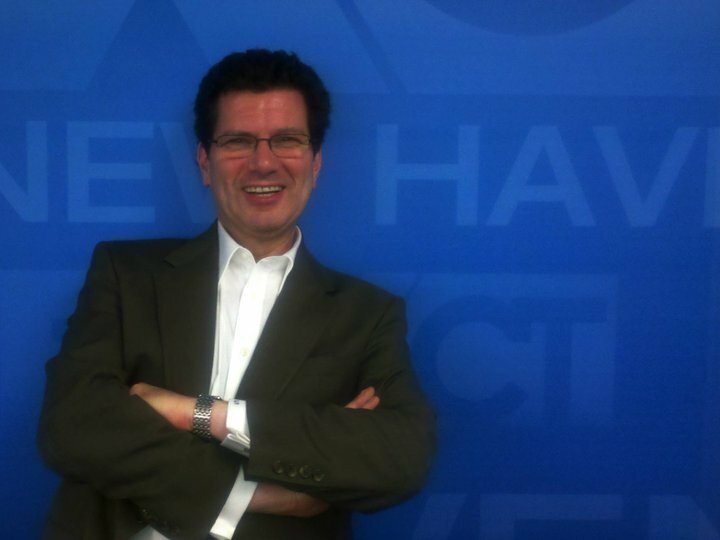 Roger Easton: You are the man! Thank you. The time to slow the progression is long gone. It’s now time to turn back the clock and return control of our private lives to ourselves. I had a heated conversation with a friend earlier today. We were talking about invasion of privacy and crumbling civil liberties. She told me I was an unusual advocate for greater privacy considering I’m on TV and publish this blog every day. What’s in this blog is the truth. It’s just not the whole truth. I don’t write everything. You won’t hear about a fight with my daughter or disagreement with my wife. I don’t write about friends making foolish choices. I’ve been on-the-air over 40 years. I understand how to compartmentalize life so I only reveal what I want revealed. This Carrier IQ story has me disturbed. The charge is CarrierIQ software, installed on many cellphones, is keeping track of your smartphone usage keystroke-by-keystroke. The company denies the accusations, but a demonstration by Torrington’s Trevor Eckhart seems to show otherwise. It doesn’t make much difference. If it’s not being collected in the phone my cell provider certainly has the capability to collect this data on their end. Don’t think they won’t do it! Verizon will now begin storing your device’s location, as well as web sites you visit while connected to their network, and will use that information to both serve you more customized advertisements and for Verizon’s internal marketing and business reports. Additionally, this information may be shared with outside companies. Verizon will do this UNLESS you opt out! Recently the Supreme Court heard arguments on a case (United States vs. Jones) that centers on police planting a GPS tracker on a car without bothering to get a warrant. The police ask, how is this different than surveillance? The justices were taken aback when the lawyer representing the government said police officers could install GPS devices on the justices’ cars and track their movements without a warrant. I work in an environment where computers speedily analyze tons of data. It’s how weather isforecast. Incorrect assumptions are made all the time! I don’t want my life scrutinized that way. We have already lost much of our privacy to businesses and the government. The time to slow the progression is long gone. We need to turn back the clock and return control of our private lives to ourselves. 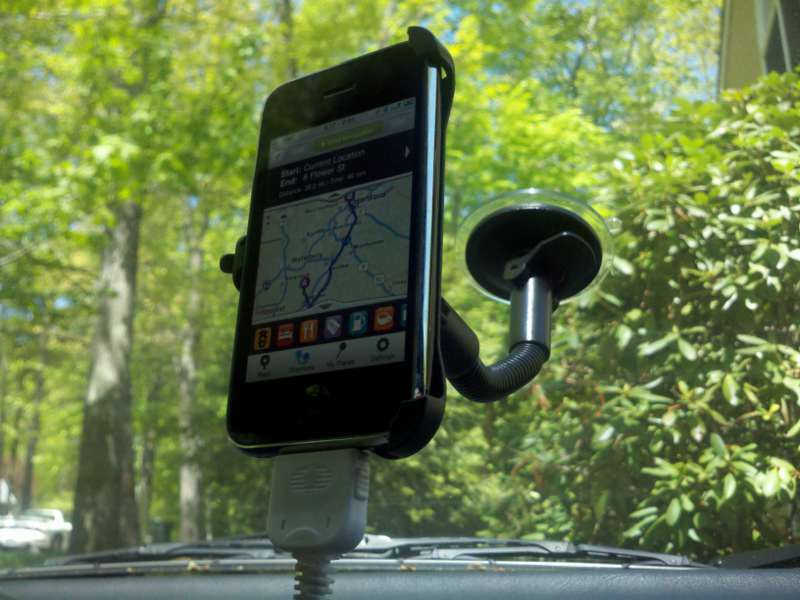 Normal people don’t suction-cup their phones to their windshields for navigation. I have been put in my place by no less than David Pogue in this morning’s New York Times. He was writing about single use devices like cameras and GPS systems and how they match up with all-in-one solutions like cell phones. Either they do or I’m not normal. Please hold your judgement! Maybe I don’t want to replace my DSLR with my iPhone (though the photo on the left was taken with a Motorola Droid X cellphone and it’s my profile picture on Facebook), but I use the camera all the time. It’s there! My DSLR often is not. The GPS is among the most valuable features my phone possesses. For under $10 I bought the suction cup Pogue has hoisted me upon. Seriously, I use this thing all-the-time in my car which has no GPS. 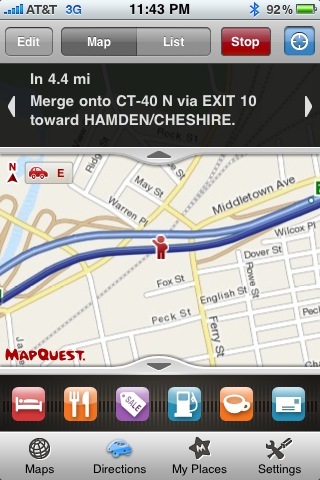 I use Mapquest4Mobile which is free on my iPhone. Google’s nav software is free on Android phones. 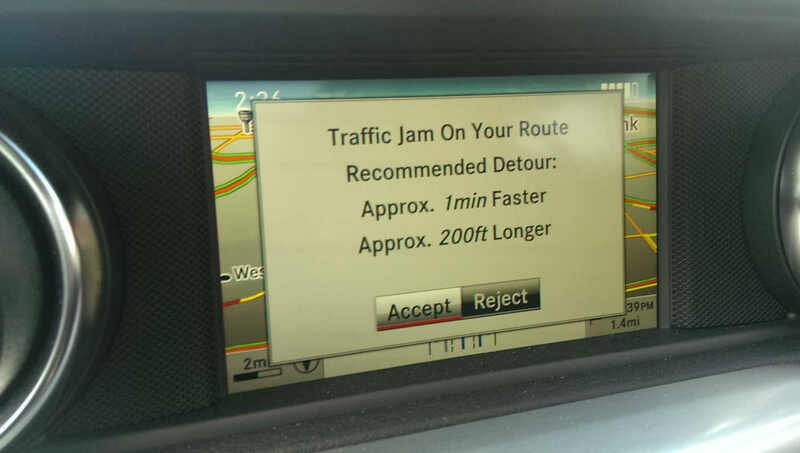 Among the many advantages: I get live traffic info because the GPS is connected to the phone which is connected to the Internet. Most people don’t suction cup their phones to their windshields. Maybe they should! If you’re using Twitter on a mobile device with built-in GPS capabilities there’s an excellent chance Twitter knows where you are! More and more as you enter the Internet you lose anonymity. Unless you really work hard to cover your tracks its likely companies know lots about you based on what you do online. They don’t need to know your name to effectively sell to you. Often they do anyway. Recently I coded a Twitter search request&#185 to send me a stream of every tweet within 15 miles of here. Twitter still doesn’t know where most people are, but the number they do know grows each day. Advertisers want to know too. Geolocation has immense potential to unlock local markets for national salesforces. Geolocation’s power is so obvious the mere thought must be intoxicating to Google and Yahoo! and the others who will take advantage. Tragically they’ll be selling ads in competition with my employer. It will be a tough fight. Generally, Twitter users follow people. By following you filter the tweets you see. Twitterers you don’t follow are invisible to you. There’s a whole twitisphere you mostly don’t see. By screening for location alone the bias of selection is removed. If Twitter knows a tweet originates near me I see it. The 15 mile localized tweetstream is a weird collection! It is good and bad and in between. What I do is cyber eavesdropping. I admit it. Often I’m deep inside the lives of people I’d otherwise never come in contact with. Like a fly on the wall they have no idea I’m reading. I’m not the only one intercepting these communiques. They’re too valuable not to be commercially mined. Revealing and personal tweets often come encoded with the latitude and longitude of the user! Click on a tweet and connect to a map with the location of the person who sent it! I can’t imagine the people who make these tweets even suspect this is happening. They are naifs! The potential for abuse is incredibly high. This morsel of wisdom floated through the Internet over the weekend. Beware! In the end the companies which profit from this data will make the decisions on what’s fair use. You will have little say. Inside a cardboard box that looks like it should be holding pork fried rice sits a Styrofoam case. The case holds the sensors and brains. Ray Gambardella left a voicemail message for me this morning. He had something he thought would interest me. 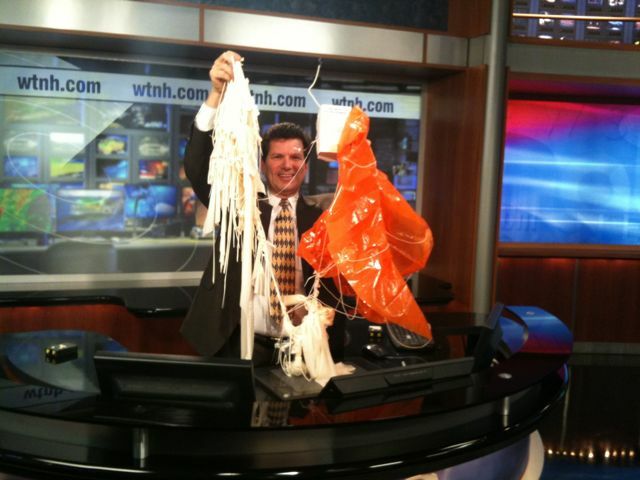 A weather balloon had come crashing down on his roof! OK–maybe that’s a little overdone. It parachuted down. Ray still had to fetch it off the roof. I picked it up this afternoon. It is a combination of new and old tech and it stunk of sulfur. More on that later. Every day at 00Z and 12Z (corresponding to 8:00 PM and 8:00 AM EDT) weather stations around the world launch radiosondes. They are carried aloft by large helium balloons. As the balloons go higher-and-higher the atmosphere around them becomes less dense. The balloon expands in size until finally it bursts! 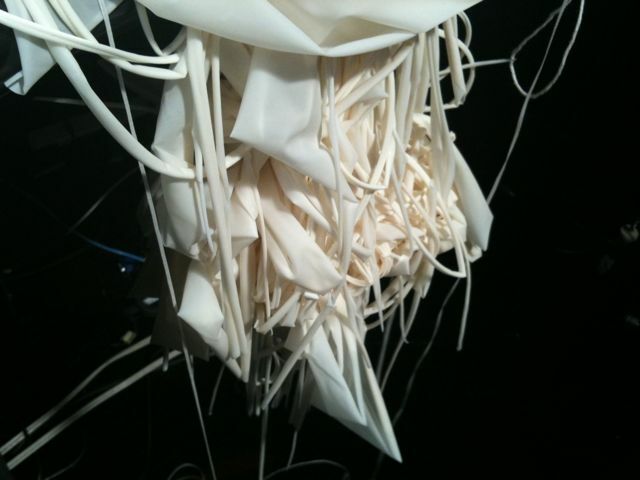 Those are the shredded remains of the balloon in the photo on the left. I called the Weather Service Office in Albany where Ray’s balloon had been launched. The meteorologist there said the balloons typically went well above 50,000 ft. At that altitude 90% or more of the Earth’s atmosphere is below the balloon! The science is contained in the more sophisticated instrument package that is tethered to the balloon. 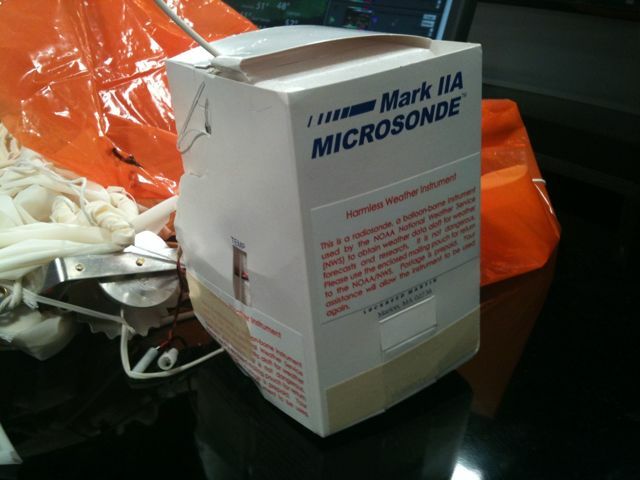 Ray’s was a Mark IIA Microsonde made by Lockheed Martin. Though Lockheed Martin is a major US defense contractor the sonde itself is assembled in Mexico. Whether that should or shouldn’t irk me–it did. Inside a cardboard box that looks like it should be holding pork fried rice sits a Styrofoam case. The case holds the sensors and brains. This radiosonde has instruments to measure temperature, moisture, pressure and ozone plus it can derive wind velocity and direction. The data plus GPS coordinates are transmitted back to ground via a radio data link. Before the balloon is launched a wet cell battery gets filled with water. The chemical reaction that produces the battery’s electricity also produces the sulfuric stink that’s tough to miss as you approach the balloon. The results of this upper air sounding are usually charted as a Skew-T Plot. As part of my meteorological training I used to do these by hand on a giant plastic sheet. They’re an excellent way to visualize the atmosphere above a singe point. Though satellites and other remote sensing methods can probe the atmosphere upper air soundings from radiosondes continue to be used because they work! Their data is heavily integrated into the computer forecast models I often talk about on TV. 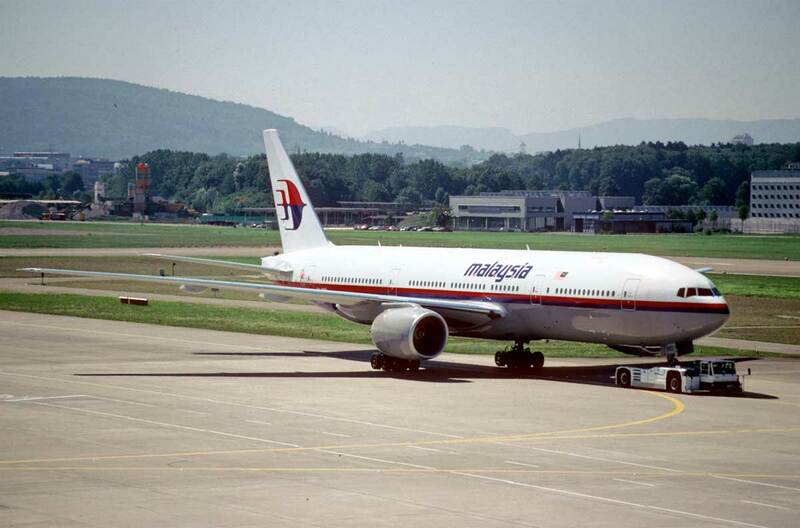 It’s amazing how much we owe to something that looks like it should be carrying Chinese food! 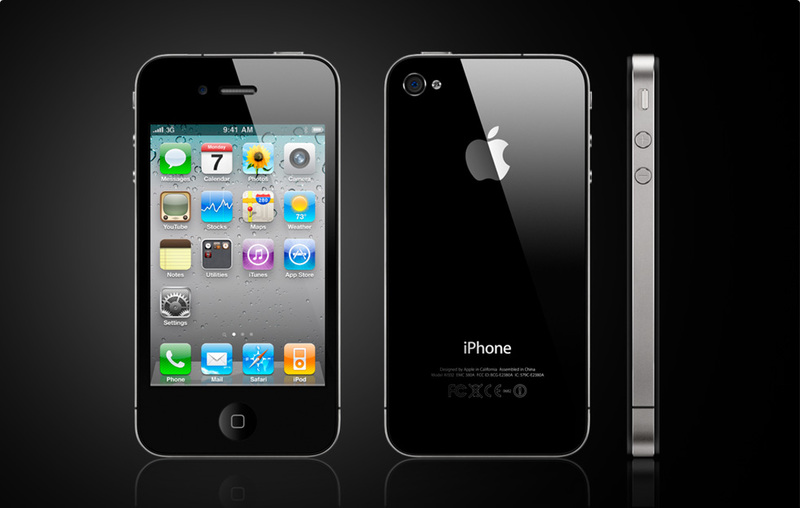 The iPhone is transformational technology. It will change your life. “It’s the best toy ever,” was what my secretive friend in the San Fernando Valley said right after he got his iPhone. He kept saying it and saying it and saying it until I too broke down. You know what? He was right. I complained originally about the keyboard and inconsistencies regarding when or which apps allow you to turn the screen to the landscape position. Still true. Horrendous battery life. Also true. I have chargers or cables at home, work and in the car. More than likely what I’m saying also applies to the new phones running the Android operating system, like the Droid and the soon to be unveiled (but already widely seen) phone from Google itself! If you just count hours I used the iPhone more when I first got it . Now I go for value and utility. I answer email and check Facebook and Twitter. I don’t update my blog with it… well I did once and it wasn’t fun! I have added apps. I’ve added enough that every once in a while I clean things out and reclaim a little space. I have been blown away by some of these little programs like the amazing ReelDirector video editor. That was $4.99 well spent! Everyone is astounded I can shoot and edit video in the phone and the quality is very good. Tonight my friend Bob showed me Glympse, which will allow a friend to track you for a set period of time. If I was driving to your house I’d send a private url which would allow you to track me and know when I’d be there. Sometimes I use the iPhone instead of my car radio to listen to shows on NPR. I flew cross country using it to watch movies. I keep France24, a 24-hour English language all-news TV network from France, as my live TV demo–though I seldom actually watch it otherwise. Yes, it’s a phone. It’s also a computer which leverages special hardware, like a GPS receiver, compass, accelerometer and touch screen. That makes it a computer that knows exactly where it is and what’s nearby. Every time a new app arrives the phone does a little more. That’s not going away any time soon. Apple is a little controlling. I wish I could see a little more of the inner digital workings.